Posted on October 7, 2015 by thelostlighthouse	in Board Games, Gaming, The Tabletop Project and tagged 15min, 2-8 players, Asmodee, board games, board gaming, Esdevium Games, Frédéric Henry, Inventions, quick game, rubbish bags, short game, Timeline, TLL, tllgaming. When were rubbish bags invented? I’ll tell you, 1950. I don’t know how I know this very random fact, but never the less, I do. 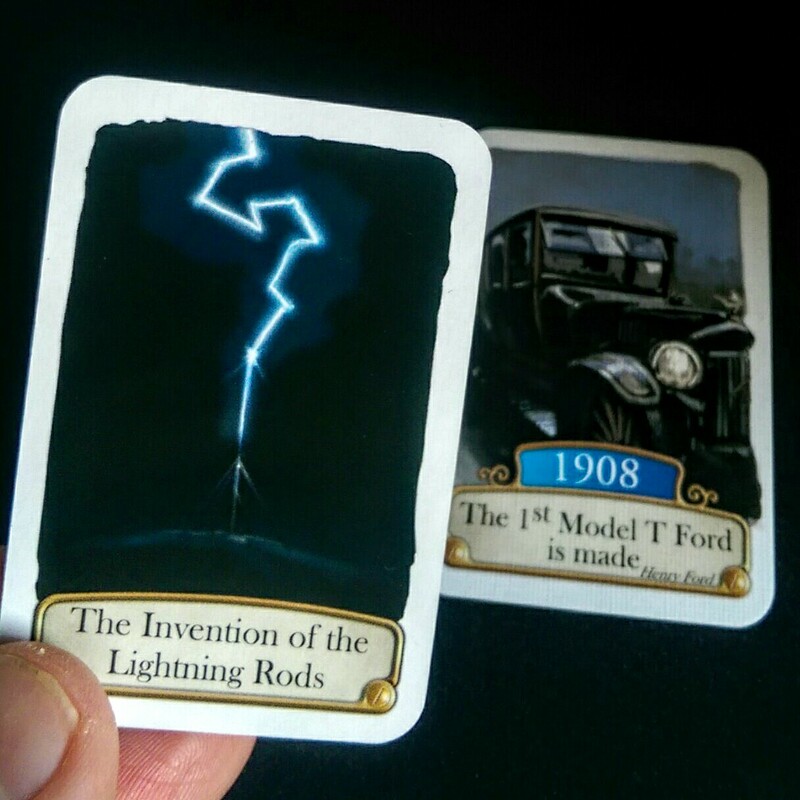 I don’t know how I knew it when I won my first game of Timeline: Inventions, but I did. It wasn’t even a guess, I knew it. I feel I’ve skipped ahead some what, in the voice of Bo Selecta Craig David, can I get a rewind! The aim of Timeline: Inventions is simple. Each player has a certain amount of double-sided cards. One side has a picture and name of an invention, and the other side is the same but has the date also. Players lay their cards date side down. Then one card is drawn from the remaining pile, and placed it the centre of the board, date side up . This is our starting point for the timeline. The first player chooses one of their inventions and decide wether or not it came before or after that first card. If they think before they place it to the left of the start card, if they think after they place it to the right. Then they flip their card, if they are correct (yay!) the card stays where it is, if they are wrong, it gets discarded and they have to draw a new one (boo!). 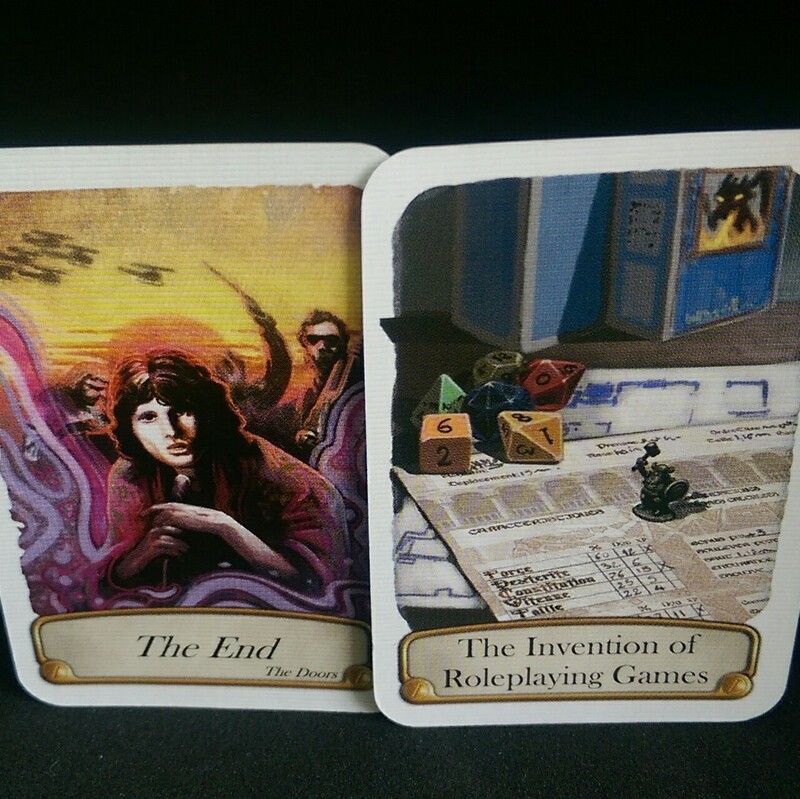 Then the second player goes, but they now the timeline has, possibly, two cards on it. So does it go before, after, or in between these dates! As the game progresses the timeline gets bigger and it’s harder to place cards as the dates get closer together. The first person to have no cards in their hand wins. The group I played with enjoyed Timeline: Inventions. It seems to fit well into that “pre big game, game” slot. The aim is very direct and there’s no real tactics to speak of, but because it’s quite a short game, it ends while it’s still interesting. The price point is good as well, barely more expensive than a cinema ticket, and for that you also get a really nice tin to house it. The art work style is also really cool, and also the choice of “inventions”. Having “RPG games” and a Doors song come up were nice treats. While no game is perfect, an issue I do have is that one of the dates that’s printed is wrong. It didn’t ruin the game what so ever, and in fact made for a good discussion afterwards. Another plus is that there are five versions of Timeline! So you can take your pick of what you think your group would like. Timeline is available at Waterstones for £12.99 or you can pick all five versions up from Amazon. 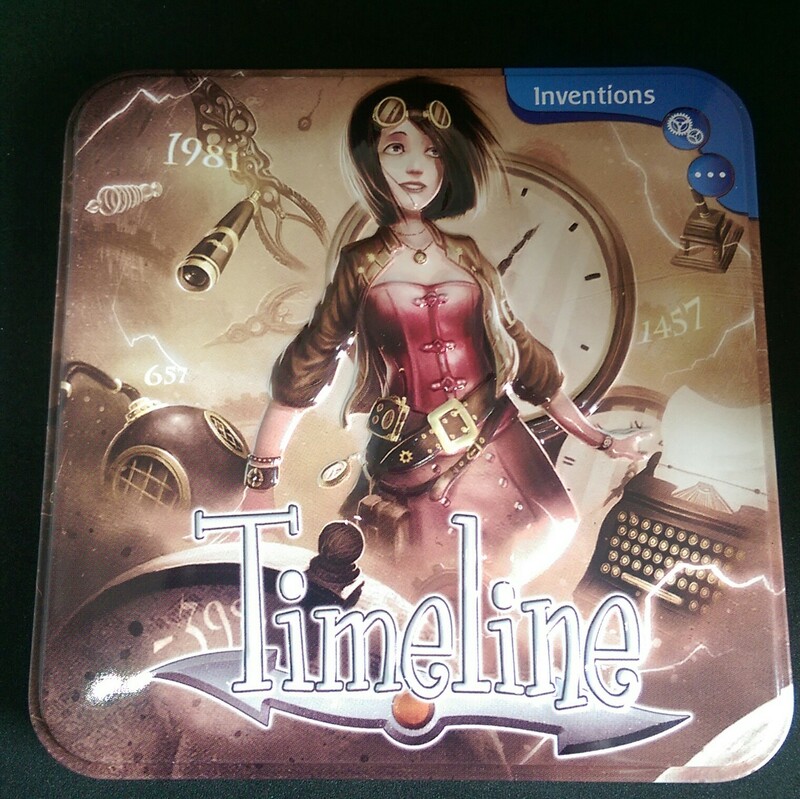 I would recommend Timeline: Inventions if you’re looking for a quick, fun game to start your evening and also who knows, you might learn a thing or two. Like, when rubbish bags were invented! A sample copy was supplied for this review.